As much as my husband and I love Mexican flavors, I have no idea why we’ve never tried tortilla soup. I got a recipe for it in my email earlier this week, which got me thinking about it, and since we had a mass quantity of chicken we needed to use up (we’re still on that massive freezer clean out), I decided it would be a great weekend lunch using staples we keep around the house and a good entry for Kahakai Kitchen’s Souper Sunday. I swear, there really is soup under there. Boil your chicken breasts to make your chicken stock (as long as you prefer, depending on how rich you like your stock). You should wind up with about 4 cups of stock when you’re finished. Remove chicken breasts and pull off all skin and bones. To the stock, add the can of tomatoes, black beans, corn, and shredded chicken. Add cumin, chili powder, cilantro, cayenne pepper, salt, and black pepper. Bring to a boil and reduce heat to simmer. Meanwhile, preheat your oven to 425. Grab those tortillas and spray each side with cooking spray (like Pam) as you place them in a stack. Now you’re going to need a baking sheet and some oven safe cooling racks (you know, the kind you use to put your cookies on to cool after you bake). You’ll be setting the cooling racks on the baking sheet and laying the tortilla strips over them. The idea is to get them elevated so that the heat can circulate all around them and you won’t have to flip them halfway through. This is the same method I use with my Homemade Tortilla Chips. Bake your tortilla strips for 8-10 minutes or until the edges are golden brown. (You may need 2 sheets to make this many). Remove from oven and sprinkle with salt. Now the soup should have been simmering for half an hour or so by now. Just long enough for the flavors to mellow out and meld (you could, of course, do this in a crock pot on low for about 4 hours if you have your stock already made). Dish it up, top with sour cream, cheddar cheese, slices of avocado, and the tortillas. 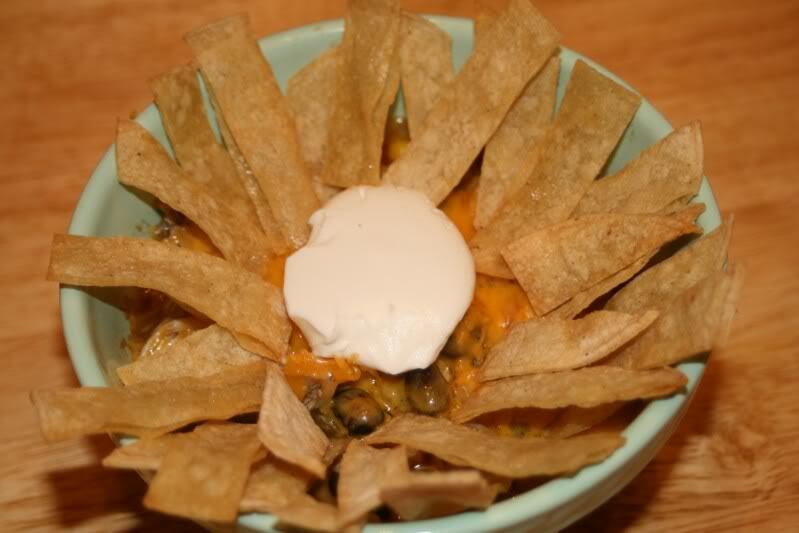 This was really delicious, and a nice, lighter alternative to our favorite taco soup. The nutrition info for the soup with just the tortillas (2 per bowl) is 404.25 calories and 4.6 grams of fat. The rest is up to what you top it with. I love a good tortilla soup. Glad you enjoyed your first go with it! I love how it looks like a big sun in the bowl with the chips too. Thanks for sending it to Souper Sundays!